Most popular worm container ever. Complete Kit with a 1 1/2 lb. 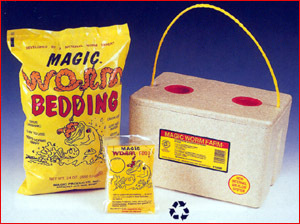 bag of Magic Worm Bedding, a 4oz. bag of Magic Worm Food, and instructions included. Ventilation system and high insulation value keeps worms in best condition possible. Large enough for ice container to be put on top of bedding when fishing and small enough to fit into refrigerator for cool storage. This Worm Farm can be used with European Night Crawlers, Red Worms, Canadian Crawlers, or just plain old garden variety Night Crawlers.